"Attorneys in Montana had to work out a plea agreement after potential jurors revolted in a pot case and made it clear that they would not convict someone for possessing a tiny amount of marijuana, The Missoulian newspaper reports. As the jury pool was being polled in Missoula last week, most of the 27 potential panelists, one after the other, said they would not convict for possession of a 16th of an ounce of pot. One juror even wondered why the county was wasting time and money prosecuting the case at all, the newspaper reports, quoting Deputy Missoula County Attorney Andrew Paul. 'I thought, 'Geez, I don't know if we can seat a jury,'' District Judge Dusty Deschamps, who called a recess, said after polling the potential jurors." The case in point ("Cornell") reflects the opinion of a jury which, if it had found the defendant guilty of possessing a small amount of marijuana, would have been obliged to sentence the defendant to a greater penalty than they felt reasonable, given the facts as they were presented. I have not mentioned Jury Nullification here before, but I agree with David Friedman. (The Beacon, December 23, 2010: "Jurors' Moral Duty".) Sometimes the law is much more harsh than it should reasonably be in the opinion of the jury; this is the opportunity, the right, and perhaps the obligation of jury members to correct the moral inequity of egregious laws. The United States Government is organized so that the three branches of government ... executive, legislative and judicial ... act as checks and balances on each other. But this nation is predicated on the rights of the individual, and sometimes people just seem to "fall through the cracks" of laws which are passed, courts which impose excessive sentences for minor offenses, and an executive who is unlikely to rectify a perceived wrong. Yes, when the system works the result might be that the executive over-rules judges who apply the strict rule of law to situations which may lead to excessively punitive sentences. A good recent example of this might be when New Jersey Governor Chris Christie commuted the sentence of a man who was sentenced to 7 years for having guns ... legally obtained in Colorado ... for having unloaded firearms in the trunk of his car. The jury in that specific case had asked the judge for clarification of fine points of the state laws, but since the judge declined to respond they felt obliged to find the defendant guilty as charged, which resulted in a 7-year prison sentence for defendant Brian Aitken. The jury, believed that the sentence was excessive but felt that they lacked the power to ignore the implied direction from the judge and find him not guilty .. which was obviously their preferred judgment. The case originally cited ("Cornell") would have imprisoned a defendant who possessed a small amount of marijuana to a similarly long period of incarceration. Rather than to drag the Executive Branch (governor, in this case) into the discussion, the jury merely refused to find the defendant guilty ... primarily because the sentence would have been excessive under the given circumstances, in their opinion. The controversy, as defined in the Beacon article, was whether (a) the jury had a responsibility to follow the Judge's implied direction, and allow the Executive Branch (governor) to decide whether to intervene; or (b) follow their own individual moral guidance and decline to render a decision which would have led to an unrealistic (but lawful) punishment. In this single specific case, they decided that the law was inappropriately harsh under the specific circumstances, and so they found the defendant "Not Guilty" .. even though they thought he might have broken the law. ...juries do not have a right to disregard the law. In fact, juries are sworn to apply the law. If they can’t do that or won’t do that–and you would not want to be before a jury that is lawless. … It’s an abomination. It’s a crime. It should not be allowed to happen. The juries should be told in no uncertain terms that if they can’t apply the law as instructed by the judge, they ought to get off. This situation is quit similar to the Olofson case, in which the defendant lent an AR-15 rifle to a friend, the rifle chain-fired multiple bursts on a single pull of the trigger, and the BATF successfully prosecuted defendant Olofson for transferring a fully automatic weapon ... even though the BATF technician testified that the full-auto burst was only replicable under certain narrowly defined circumstances. What looked like a "full auto" offense to the BATF may have looked like a "malfunction" to people who are fully cognizant of the technical aspects. The jury was not conversant with the technical points, so Mr. Olofson was also sentenced to prison. A better informed jury, the members having been aware of the concept of "Jury Nullification", might have decided to apply a more lenient sentence -- especially considering that the prosecutor and the judge conspired to provide narrow definitions and instructions to the jury. The jury in the Aitkens case might also ruled differently, if they were less intimidated by the judge's instructions .. or in that case, lack of instruction. But now, in the "Cornell" case, we see a clear precedent that a jury might successfully interfere with the smooth flow of "justice" when they believe that Justice is not served by either an excessively harsh interpretation of the law, or by judicial instructions. Might we all perhaps discover that our duty as jurors is to decide on the side of Justice, rather than "justice"? I don’t think I have a moral obligation to abide by the law when the law is wrong. I may have a moral obligation to violate it, but this could be a very long argument. Iain Harrison (2010 Top Shoot Champion) is quoted in an interview about the competition, and provides an "insider" viewpoint on the making of the Top Shot "survivor" series. Iain is a Local Shooter, and I've enjoyed squadding with him from time to time ... even if I can't always spell his name correctly. The man has a slightly manic sense of humor, and I enjoyed his interview. You may enjoy it, also. See the detailed interview here. Remember shipping your ammunition to the host hotel at a 'far away' match? You always shipped it marked "ORM-D", right? That's how I always shipped it. Because the U.S. is striving mightily under the Current Administration (aka "Obama-Mania") to synchronize all aspects of American practices to conform to European Practices. That is to say, International Specifications. But the United Nations doesn't have an "ORM-D" designation for shipping ammunition without the need to add a "Hazardous Materials" (Haz-Mat) fee. So the plan is to assign a new designation -- "LQ" -- the same permissions as as "ORM-D", and begin shipping ammunition under that tag. It seems simple enough; we just change the labeling on ammunition shipped in the United Sates from ORM-D to LQ, and continue with our lives with no other changes. The only problem here is that we thus given up our ORM-D designation, and we have little or no control over any arbitrary redefinition of the "LQ" shipping label. If the United Nations decides, even unilaterally, to change the definition of that label, it is entirely possible that we may be obliged, under the terms of a "treaty" (look it up ... it has the power of law and is NOT subject to constitutional obligations under international law) to follow their definition of "LQ" labeling. That means that American citizens, or citizens of any treaty nation, are legally obliged to follow the UN definition. We have no recourse. Neither the Executive, nor the Legislative, nor the Judicial branch of the American government may change the law to suit our individual national laws. We are obliged to conform to what has become an International Law. Ship ammunition without paying a Hazardous Material fee? Not our choice, not any more, not ever again. Do you remember how much the Hazardous Material fee is for, say, shipping Primers? You'll have to pay it. No use writing to your congressman then, because he has absolutely no choice but to comply. Curiously, in the United States of America, lone primers are subject to the hazmat fee; loaded ammunition is not. Do you want to see that changed? Neither do I. You might want to talk to your congressman about that today; tomorrow may be too late. Providence program destroys children’s toy guns - The Boston Globe: "’Tis the season for joy, peace, and grinding up plastic, orange-tipped AK-47s. 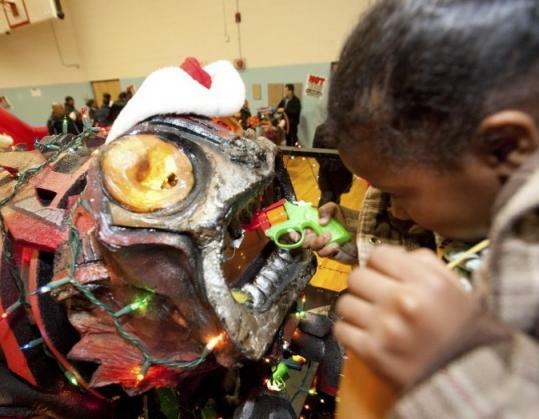 For seven years, Providence municipal and law enforcement officials have organized the event around Christmastime as a way to raise awareness of the dangers of playing with guns, real or fake. The event is a mix of the macabre and the playful, a children’s version of the gun buyback program in which adults trade firearms for gift certificates. Yesterday, younger children ran through a rubber obstacle course while officials told the older children the story of a 14-year-old boy who police nearly shot after they confused his air pistol with a real gun. In exchange for their toy guns, all the children received wrapped presents that were indisputably not violent — dolls, stuffed animals, and board games like checkers." This entire store is based on a single, if complex, premise: "Guns Are Bad!" Diane Levin, professor of education at Wheelock College, said police and parents coming together to destroy toy guns sends a powerful message to children. But adults should follow up with children to explain the complexities of weapons and violence so they can more efficiently counter the seductive image of guns in movies and video games. Even though the author (and the interviewed participants) take the long way around the barn to present their thesis, it still ends up with the same unsupported and unsupportable premise: "Guns Are Bad!". Interestingly, if the article is true to the message and rationale of the 'project', there is no clear explanation of WHY "Guns Are Bad!" In fact, we don't here have even so much as a clue as to HOW "Guns Are Bad!" It's difficult to determine whether the article was edited for length by a copy-editor who just didn't have the space to include the explanation, or whether the reporter failed to record it, or even if the sponsors of the project failed to explain it. All we know is that "Guns Are Bad! ", and apparently we either (a) know intuitively that "Guns Are Bad! ", or (b) we are easily swayed by the argument that if these people put so much effort into taking toy guns off the mean streets of Providence, R.I., they must be right if only because they are so darn sincere! "Gun Buy-Back" schemes are nothing new. For years, these schemes have been the premier way for gang members to dispose of their 9's after using them in a drive-by. They don't even have to file off the serial numbers ... the local police are happy to chop up the guns if only to get them off the streets. But these are not real guns; they're toys. They are not lethal weapons, they are only icons. Maybe that's the Liberal Message .. which is to say, the Message is the Massage, a la Marshall Mcluhan. These ... people ... are feeding their children a message which will shape their perceptions for the rest of their young lives. It's all propaganda, it's a Skinnerism ... behavior modification by learned response to stimulus. When these children achieve adulthood, they will remember only that "Guns Are Bad! "; they won't think about why or how they are bad, only that their mommies told them so, and they won't have to think for themselves. These nice people who took away their toys are powerful authority figures, and the children, in adulthood, will have been programmed to a very specific thought pattern. Some children were not thrilled with the trade. Malik Hall, a round-eyed second-grader, looked apprehensive as he stood in line with his favorite toy, a thick, blue gun with plastic sword underneath the muzzle. The 8-year-old was furious when his mother, Amanda, told him he would have to give it up. Yesterday morning, he tried to hide it under his pillow, she said. But when it was his turn, Malik strode dry-eyed and with quiet dignity to the Bash-O-Matic and fed it the gun. When his mother approached, he said nothing. “You don’t want to talk to me?’’ Hall asked. He looked at her stonily and left to retrieve his gift. Way to go, Malik. Nil Carborundum Illigitimi. PS: oh, by the way. Looking at the photograph which accompanied the article ... a small boy feeding his plastic gun into the "Bash-O-Matic", I wondered how a concerned parent could all their child to push a plastic toy into a mangle. Perhaps they are so concerned about the possible influence of The Evil Gun, they pay no attention to the possiblilty of a child losing a finger ... or a hand ... to the evils of the "Bash-O-Matic". In the timeless words of Bugs Bunny: "What a bunch of Maroons!" I discovered today (via a link from The Michael Bane Blog) a website named "AccurateShooter.com"
Never mind the direct link, I found on the sidebar some excellent mini-articles submitted by members. 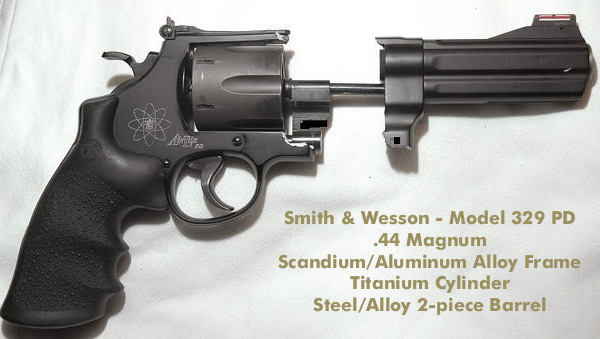 One of these discussed the use of ultra-light revolvers, which are created with an alloy of Scandium and Aluminum, and at least in the case of the S&W 329 are chambered in the very powerful .44 Magnum Pistol cartridge. I've fired a Model 29, which was constructed of all steel. It was very heavy, and the perceived recoil was, too me, excessive. But then, I'm a wuss. No need for much commentary from me. The result was that the revolver was shredded like yesterday's newspaper on a rainy Pacific North-Wet day, and nobody seems to know exactly why factory ammunition should have caused that KaBOOM! ... which must have been very impressive to the owner (who apparently decided he had no further need for a .44 Magnum Scandium revolver). There are links in the article which will lead the curious reader to more information. This particular revolver seems to currently be unusable as a bud vase. Its ability to hold liquids have been ... compromised. Go, read the whole thing.